This is a long and frightening article about Iran and its lunatic president, and a must-read if you want to understand the true nature of our -- and the West's -- enemy, Iran. This article is from the April 4th issue of New Republic online, but is unfortunately no longer online. Since I had already copied and pasted it, and given the increasing danger that Iran is becoming, I decided to post it now. The sacrifice of the Basiji was ghastly. And yet, today, it is a source not of national shame, but of growing pride. Since the end of hostilities against Iraq in 1988, the Basiji have grown both in numbers and influence. They have been deployed, above all, as a vice squad to enforce religious law in Iran, and their elite "special units" have been used as shock troops against anti-government forces. In both 1999 and 2003, for instance, the Basiji were used to suppress student unrest. And, last year, they formed the potent core of the political base that propelled Mahmoud Ahmadinejad--a man who reportedly served as a Basij instructor during the Iran-Iraq War--to the presidency. Ahmadinejad revels in his alliance with the Basiji. He regularly appears in public wearing a black-and-white Basij scarf, and, in his speeches, he routinely praises "Basij culture" and "Basij power," with which he says "Iran today makes its presence felt on the international and diplomatic stage." Ahmadinejad's ascendance on the shoulders of the Basiji means that the Iranian Revolution, launched almost three decades ago, has entered a new and disturbing phase. A younger generation of Iranians, whose worldviews were forged in the atrocities of the Iran-Iraq War, have come to power, wielding a more fervently ideological approach to politics than their predecessors. The children of the Revolution are now its leaders. In 1980, the Ayatollah Khomeini called the Iraqi invasion of Iran a "divine blessing," because the war provided him the perfect opportunity to Islamize both Iranian society and the institutions of the Iranian state. As Saddam's troops pushed into Iran, Khomeini's fanatically devoted Revolutionary Guard moved rapidly to mobilize and prepare their air and sea forces. At the same time, the regime hastened to develop the Basiji as a popular militia. Whereas the Revolutionary Guard consisted of professionally trained adult soldiers, the Basiji was essentially composed of boys between twelve and 17 and men over 45. They received only a few weeks of training--less in weapons and tactics than in theology. Most Basiji came from the countryside and were often illiterate. When their training was done, each Basiji received a blood-red headband that designated him a volunteer for martyrdom. According to Sepehr Zabih's The Iranian Military in Revolution and War, such volunteers made up nearly one-third of the Iranian army--and the majority of its infantry. The chief combat tactic employed by the Basiji was the human wave attack, whereby barely armed children and teenagers would move continuously toward the enemy in perfectly straight rows. It did not matter whether they fell to enemy fire or detonated the mines with their bodies: The important thing was that the Basiji continue to move forward over the torn and mutilated remains of their fallen comrades, going to their deaths in wave after wave. Once a path to the Iraqi forces had been opened up, Iranian commanders would send in their more valuable and skilled Revolutionary Guard troops. This approach produced some undeniable successes. "They come toward our positions in huge hordes with their fists swinging," one Iraqi officer complained in the summer of 1982. "You can shoot down the first wave and then the second. But at some point the corpses are piling up in front of you, and all you want to do is scream and throw away your weapon. Those are human beings, after all!" By the spring of 1983, some 450,000 Basiji had been sent to the front. After three months, those who survived deployment were sent back to their schools or workplaces. But three months was a long time on the front lines. In 1982, during the retaking of the city of Khorramshahr, 10,000 Iranians died. Following "Operation Kheiber," in February 1984, the corpses of some 20,000 fallen Iranians were left on the battlefield. The "Karbala Four" offensive in 1986 cost the lives of more than 10,000 Iranians. All told, some 100,000 men and boys are said to have been killed during Basiji operations. Why did the Basiji volunteer for such duty? Most of them were recruited by members of the Revolutionary Guards, which commanded the Basiji. These "special educators" would visit schools and handpick their martyrs from the paramilitary exercises in which all Iranian youth were required to participate. Propaganda films--like the 1986 TV film A Contribution to the War--praised this alliance between students and the regime and undermined those parents who tried to save their children's lives. (At the time, Iranian law allowed children to serve even if their families objected.) Some parents, however, were lured by incentives. In a campaign called "Sacrifice a Child for the Imam," every family that lost a child on the battlefield was offered interest-free credit and other generous benefits. Moreover, enrollment in the Basiji gave the poorest of the poor a chance for social advancement. Still others were coerced into "volunteering." In 1982, the German weekly Der Spiegel documented the story of a twelve-year-old boy named Hossein, who enlisted with the Basiji despite having polio: One day, some unknown imams turned up in the village. They called the whole population to the plaza in front of the police station, and they announced that they came with good news from Imam Khomeini: The Islamic Army of Iran had been chosen to liberate the holy city Al Quds--Jerusalem--from the infidels. ... The local mullah had decided that every family with children would have to furnish one soldier of God. Because Hossein was the most easily expendable for his family, and because, in light of his illness, he could in any case not expect much happiness in this life, he was chosen by his father to represent the family in the struggle against the infidel devils. Of the 20 children that went into battle with Hossein, only he and two others survived. But, if such methods explained some of why they volunteered, it did not explain the fervor with which they rushed to their destruction. That can only be elucidated by the Iranian Revolution's peculiar brand of Islam. At the beginning of the war, Iran's ruling mullahs did not send human beings into the minefields, but rather animals: donkeys, horses, and dogs. But the tactic proved useless: "After a few donkeys had been blown up, the rest ran off in terror," Mostafa Arki reports in his book Eight Years of War in the Middle East. The donkeys reacted normally--fear of death is natural. The Basiji, on the other hand, marched fearlessly and without complaint to their deaths. The curious slogans that they chanted while entering the battlefields are of note: "Against the Yazid of our time! "; "Hussein's caravan is moving on! "; "A new Karbala awaits us!" Yazid, Hussein, Karbala--these are all references to the founding myth of Shia Islam. In the late seventh century, Islam was split between those loyal to the Caliph Yazid--the predecessors of Sunni Islam--and the founders of Shia Islam, who thought that the Imam Hussein, grandson of the Prophet Muhammad, should govern the Muslims. In 680, Hussein led an uprising against the "illegitimate" caliph, but he was betrayed. On the plain of Karbala, on the tenth day of the month of Muharram, Yazid's forces attacked Hussein and his entourage and killed them. Hussein's corpse bore the marks of 33 lance punctures and 34 blows of the sword. His head was cut off and his body was trampled by horses. Ever since, the martyrdom of Hussein has formed the core of Shia theology, and the Ashura Festival that commemorates his death is Shiism's holiest day. On that day, men beat themselves with their fists or flagellate themselves with iron chains to approximate Hussein's sufferings. At times throughout the centuries, the ritual has grown obscenely violent. In his study Crowds and Power, Elias Canetti recounts a firsthand report of the Ashura Festival as it occurred in mid-nineteenth-century Tehran: 500,000 people, in the grip of delirium, cover their heads with ashes and beat their foreheads against the ground. They want to subject themselves voluntarily to torments: to commit suicide en masse, to mutilate themselves with refinement. ... Hundreds of men in white shirts come by, their faces ecstatically raised toward the sky. Of these, several will be dead this evening, many will be maimed and mutilated, and the white shirts, dyed red, will be burial shrouds. ... There is no more beautiful destiny than to die on the Festival of Ashura. The gates of the eight Paradises are wide open for the holy and everyone tries to get through them. Bloody excesses of this sort are prohibited in contemporary Iran, but, during the Iran-Iraq War, Khomeini appropriated the essence of the ritual as a symbolic act and politicized it. He took the inward-directed fervor and channeled it toward the external enemy. He transformed the passive lamentation into active protest. He made the Battle of Karbala the prototype of any fight against tyranny. Indeed, this technique had been used during political demonstrations in 1978, when many Iranian protestors wore funeral shrouds in order to tie the battle of 680 to the contemporary struggle against the shah. In the war against Iraq, the allusions to Karbala were given still greater significance: On the one hand, the scoundrel Yazid, now in the form of Saddam Hussein; on the other, the Prophet's grandson, Hussein, for whose suffering the time of Shia revenge had finally come. The power of this story was further reinforced by a theological twist that Khomeini gave it. According to Khomeini, life is worthless and death is the beginning of genuine existence. "The natural world," he explained in October 1980, "is the lowest element, the scum of creation. "What is decisive is the beyond: The "divine world, that is eternal." This latter world is accessible to martyrs. Their death is no death, but merely the transition from this world to the world beyond, where they will live on eternally and in splendor. Whether the warrior wins the battle or loses it and dies a Martyr--in both cases, his victory is assured: either a mundane or a spiritual one. This attitude had a fatal implication for the Basiji: Whether they survived or not was irrelevant. Not even the tactical utility of their sacrifice mattered. Military victories are secondary, Khomeini explained in September 1980.The Basiji must "understand that he is a 'soldier of God' for whom it is not so much the outcome of the conflict as the mere participation in it that provides fulfillment and gratification." Could Khomeini's antipathy for life have had as much effect in the war against Iraq without the Karbala myth? Probably not.With the word "Karbala" on their lips, the Basiji went elatedly into battle. For those whose courage still waned in the face of death, the regime put on a show. A mysterious horseman on a magnificent steed would suddenly appear on the front lines. His face--covered in phosphorous--would shine. His costume was that of a medieval prince. A child soldier, Reza Behrouzi, whose story was documented in 1985 by French writer Freidoune Sehabjam, reported that the soldiers reacted with a mixture of panic and rapture. Everyone wanted to run toward the horseman. But he drove them away. "Don't come to me!" he shouted, "Charge into battle against the infidels! ... Revenge the death of our Imam Hussein and strike down the progeny of Yazid!" As the figure disappears, the soldiers cry: "Oh, Imam Zaman, where are you?" They throw themselves on their knees, and pray and wail. When the figure appears again, they get to their feet as a single man. Those whose forces are not yet exhausted charge the enemy lines. The mysterious apparition who was able to trigger such emotions is the "hidden imam," a mythical figure who influences the thought and action of Ahmadinejad to this day. The Shia call all the male descendants of the Prophet Muhammad "imams" and ascribe to them a quasidivine status. Hussein, who was killed at Karbala by Yazid, was the third Imam. His son and grandson were the fourth and fifth. At the end of this line, there is the "Twelfth Imam," who is named Muhammad. Some call him the Mahdi (the "divinely guided one"), though others say imam Zaman (from sahib-e zaman: "the ruler of time"). He was born in 869, the only son of the eleventh Imam. In 874, he disappeared without a trace, thereby bringing Muhammad's lineage to a close. In Shia mythology, however, the Twelfth Imam survived. The Shia believe that he merely withdrew from public view when he was five and that he will sooner or later emerge from his "occultation" in order to liberate the world from evil. Writing in the early '80s, V. S. Naipaul showed how deeply rooted the belief in the coming of the Shia messiah is among the Iranian population. In Among the Believers: An Islamic Journey, he described seeing posters in post-Revolutionary Tehran bearing motifs similar to those of Maoist China: crowds, for instance, with rifles and machine guns raised in the air as if in greeting. The posters always bore the same phrase: twelfth imam, we are waiting for you. Naipaul writes that he could grasp intellectually the veneration for Khomeini. "But the idea of the revolution as something more, as an offering to the Twelfth Imam, the man who had vanished ... and remained 'in occultation,' was harder to seize." According to Shia tradition, legitimate Islamic rule can only be established following the reappearance of the Twelfth Imam. Until that time, the Shia have only to wait, to keep their peace with illegitimate rule, and to remember the Prophet's grandson, Hussein, in sorrow. Khomeini, however, had no intention of waiting. He vested the myth with an entirely new sense: The Twelfth Imam will only emerge when the believers have vanquished evil. To speed up the Mahdi's return, Muslims had to shake off their torpor and fight. This activism had more in common with the revolutionary ideas of Egypt's Muslim Brotherhood than with Shia traditions. Khomeini had been familiar with the texts of the Muslim Brothers since the 1930s, and he agreed with the Brothers' conception of what had to be considered "evil": namely, all the achievements of modernity that replaced divine providence with individual self-determination, blind faith with doubt, and the stern morality of sharia with sensual pleasures. According to legend, Yazid was the embodiment of everything that was forbidden: He drank wine, enjoyed music and song, and played with dogs and monkeys. And was not Saddam just the same? In the war against Iraq, "evil" was clearly defined, and vanquishing evil was the precondition for hastening the return of the beloved Twelfth Imam. When he let himself be seen for a few minutes riding his white steed, the readiness to die a martyr's death increased considerably. It was this culture that nurtured Mahmoud Ahmadinejad's worldview. Born outside Tehran in 1956, the son of blacksmith, he trained as a civil engineer, and, during the Iran-Iraq War, he joined the Revolutionary Guards. His biography remains strangely elliptical. Did he play a role in the 1979 takeover of the U.S. Embassy, as some charge? What exactly did he do during the war? These are questions for which we have no definite answers. His presidential website says simply that he was "on active service as a Basij volunteer up to the end of the holy defense [the war against Iraq] and served as a combat engineer in different spheres of duty." We do know that, after the war's end, he served as the governor of Ardebil Province and as an organizer of Ansar-e Hezbollah, a radical gang of violent Islamic vigilantes. 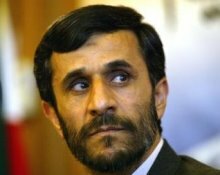 After becoming mayor of Tehran in April 2003, Ahmadinejad used his position to build up a strong network of radical Islamic fundamentalists known as Abadgaran-e Iran-e Islami, or Developers of an Islamic Iran. It was in that role that he won his reputation--and popularity--as a hardliner devoted to rolling back the liberal reforms of then-President Muhammad Khatami. Ahmadinejad positioned himself as the leader of a "second revolution" to eradicate corruption and Western influences from Iranian society. And the Basiji, whose numbers had grown dramatically since the end of the Iran-Iraq War, embraced him. Recruited from the more conservative and impoverished parts of the population, the Basiji fall under the direction of--and swear absolute loyalty to--the Supreme Leader Ali Khameini, Khomeini's successor. During Ahmadinejad's run for the presidency in 2005, the millions of Basiji--in every Iranian town, neighborhood, and mosque--became his unofficial campaign workers. Since Ahmadinejad became president, the influence of the Basiji has grown. In November, the new Iranian president opened the annual "Basiji Week," which commemorates the martyrs of the Iran-Iraq War. According to a report in Kayan, a publication loyal to Khameini, some nine million Basiji--12 percent of the Iranian population--turned out to demonstrate in favor of Ahmadinejad's anti-liberal platform. The article claimed that the demonstrators "form[ed] a human chain some 8,700 kilometers long. ... In Tehran alone, some 1,250,000 people turned out." Barely noticed by the Western media, this mobilization attests to Ahmadinejad's determination to impose his "second revolution" and to extinguish the few sparks of freedom in Iran. At the end of July 2005, the Basij movement announced plans to increase its membership from ten million to 15 million by 2010. The elite special units are supposed to comprise some 150,000 people by then. Accordingly, the Basiji have received new powers in their function as an unofficial division of the police. What this means in practice became clear in February 2006, when the Basiji attacked the leader of the bus-drivers' union, Massoud Osanlou. They held Osanlou prisoner in his apartment, and they cut off the tip of his tongue in order to convince him to keep quiet. No Basiji needs to fear prosecution for such terrorists tactics before a court of law. As Basij ideology and influence enjoy a renaissance under Ahmadinejad, the movement's belief in the virtues of violent self-sacrifice remains intact. There is no "truth commission" in Iran to investigate the state-planned collective suicide that took place from 1980 to 1988. Instead, every Iranian is taught the virtues of martyrdom from childhood. Obviously, many of them reject the Basij teachings. Still, everyone knows the name of Hossein Fahmideh, who, as a 13-year-old boy during the war, blew himself up in front of an Iraqi tank. His image follows Iranians throughout their day: whether on postage stamps or the currency. If you hold up a 500 Rial bill to the light, it is his face you will see in the watermark. The self-destruction of Fahmideh is depicted as a model of profound faith by the Iranian press. It has been the subject of both an animated film and an episode of the TV series "Children of Paradise." As a symbol of their readiness to die for the Revolution, Basij groups wear white funeral shrouds over their uniforms during public appearances. During this year's Ashura Festival, school classes were taken on excursions to a "Martyrs' Cemetery." "They wear headbands painted with the name Hussein," The New York Times reported, "and march beneath banners that read: 'Remembering the Martyrs today is as important as becoming a Martyr' and 'The Nation for whom Martyrdom means happiness, will always be Victorious.' " Since 2004, the mobilization of Iranians for suicide brigades has intensified, with recruits being trained for foreign missions. Thus, a special military unit has been created bearing the name "Commando of Voluntary Martyrs. "According to its own statistics, this force has so far recruited some 52,000 Iranians to the suicidal cause. It aims to form a "martyrdom unit" in every Iranian province. The Basiji's cult of self-destruction would be chilling in any country. In the context of the Iranian nuclear program, however, its obsession with martyrdom amounts to a lit fuse. Nowadays, Basiji are sent not into the desert, but rather into the laboratory. Basij students are encouraged to enroll in technical and scientific disciplines. According to a spokesperson for the Revolutionary Guard, the aim is to use the "technical factor" in order to augment "national security." What exactly does that mean? Consider that, in December 2001, former Iranian President Hashemi Rafsanjani explained that "the use of even one nuclear bomb inside Israel will destroy everything." On the other hand, if Israel responded with its own nuclear weapons, it "will only harm the Islamic world. It is not irrational to contemplate such an eventuality." Rafsanjani thus spelled out a macabre cost-benefit analysis. It might not be possible to destroy Israel without suffering retaliation. But, for Islam, the level of damage Israel could inflict is bearable--only 100,000 or so additional martyrs for Islam. And Rafsanjani is a member of the moderate, pragmatic wing of the Iranian Revolution; he believes that any conflict ought to have a "worthwhile" outcome. Ahmadinejad, by contrast, is predisposed toward apocalyptic thinking. In one of his first TV interviews after being elected president, he enthused: "Is there an art that is more beautiful, more divine, more eternal than the art of the martyr's death?" In September 2005, he concluded his first speech before the United Nations by imploring God to bring about the return of the Twelfth Imam. He finances a research institute in Tehran whose sole purpose is to study, and, if possible, accelerate the coming of the imam. And, at a theology conference in November 2005, he stressed, "The most important task of our Revolution is to prepare the way for the return of the Twelfth Imam." A politics pursued in alliance with a supernatural force is necessarily unpredictable.Why should an Iranian president engage in pragmatic politics when his assumption is that, in three or four years, the savior will appear? If the messiah is coming, why compromise? That is why, up to now, Ahmadinejad has pursued confrontational policies with evident pleasure. The history of the Basiji shows that we must expect monstrosities from the current Iranian regime. Already, what began in the early '80s with the clearing of minefields by human detonators has spread throughout the Middle East, as suicide bombing has become the terrorist tactic of choice. The motivational shows in the desert--with hired actors in the role of the hidden imam--have evolved into a showdown between a zealous Iranian president and the Western world. And the Basiji who once upon a time wandered the desert armed only with a walking stick is today working as a chemist in a uranium enrichment facility. Matthias Küntzel is a political scientist in Hamburg, Germany, and author of Djihad und Judenhass (or Jihad and Jew-Hatred). Iran—a country that makes Baathist soldiers look like humanitarians (and donkeys like creatures of superior rationality). A couple of questions arising from the article...(1) Can people who set up fake spiritual manifestations be genuine believers themselves? (2) Would any Western army have the stomach to shoot down human waves of 12 year olds?